MiVoice Office 400 Most versatile solution specifically for medium and smaller sized businesses. Opens the full performance spectrum of modern business communication. What’s more, the market is currently seeing a trend toward virtualization and cloud-based communication. MiVoice Office 400 is also ideal for customers wanting to pursue this route: With MiVoice Office 400 Virtual Appliance, customers can take the smooth path and grow with their business to even more than 600 users. As a highly flexible communications solution that can be adapted to business requirements and the needs of employees, MiVoice Office 400 is setting new standards in its field. Delivering a flexible, versatile communications solution, MiVoice Office 400 has been specially designed to meet the needs of small and medium-sized businesses, allowing additional users, new telephones or even additional locations to be integrated with ease. The Mitel 470 controller can be used for up to 400 users in a stand alone configuration. In a networked system, up to 600 users, that can be distributed on 50 different sites, can also have access to the full range of services offered by the MiVoice Office 400 communication servers. 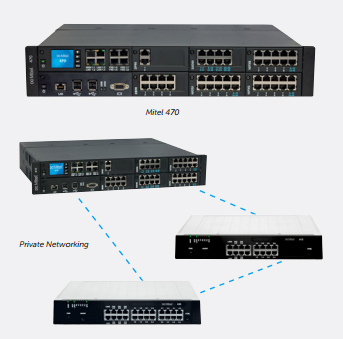 Mitel 470 can also be fitted with an integrated application server. This server allows innovative communication services to be seamlessly integrated into the system. Examples are multimedia communication, unified communications (voice, e-mail, chat, fax etc.) as well as collaborative work.